William Faulkner wrote, "Sometimes I think there must be a sort of pollen of ideas floating in the air, which fertilizes similarly minds here and there which have not had direct contact." That is a poetic way to think of how we all share information and ideas across our wide and diverse community. I will try to remember that while I take my anti-histamine and hope for rain Have a great week and please enjoy the rest of the digest! + Our customer speaker applications are open for Tableau Conference 2019! + Don't miss out on your chance to join #data19 in Berlin at a discounted rate. Register today to save: TC Europe Tickets. Prices go up this Friday, April 5th. + 2019.2 is in beta! Vector maps, parameter actions, new Ask Data functionalist and more! Check out the blog with all the exciting details from Tableau Product Marketing Specialist Emily Chen here: Now in beta: Vector maps, parameter actions, and new Ask Data functionality | Tableau Software .  This week our top-voted idea is Allow users to set bar, line, shape, and padding widths by pixels or percents. This was just posted on March 28th by Skylark Macadamia and already has 16 votes. In the text they share, "Currently Tableau offers limited control over chart design. Allowing users to set exact pixel widths or percentages for bars, lines, shapes, and padding within charts, will allow greater design precision and lead to cohesive designs within dashboards. Allowing users precise control over these features will also help them conform dashboard designs to existing brand guidelines." If you agree that this is needed click on the link and up-vote the idea. Our most talked about thread this week is on Joins in Tableau by Twinkle Bansal . In the initial thread, they shared, "Actually table '_users' is not having direct join with table '_projects' so I joined that one with table 'sites' and wrote below query. But again and again am getting error 'Invalid FROM Clause near table _users':" ... it continues from there. The author is using PostgreSQL and involved some but not all users having access to the particular project. Ari G was able to help Twinkle to a solution and shared details in the thread. There are numerous threads in the forums on users have trouble with joins both in Tableau Desktop and Prep. Many of the common questions have been solved so we encourage you to search through the forums for a solution before posting a question. The answer to your question may very well be already posted and this is a great opportunity to learn more with Tableau! As we will continue to share, in the Tableau Forums, we frequently request those who post questions to attach a packaged workbook. This document is to help you understand when a packaged workbook helps, why we ask for it, and how to include one: Packaged workbooks: when, why, how . Please bookmark this resource! + Tableau Public Ambassador Rajeev Pandey shares how to create a block bar donut chart in a recent blog post and in support of the #PreppinData challenge from Tableau Ambassador Carl Allchin and Jonathan Allenby he wrote a piece encouraging readers to "Think About Your Data Holistically." Enjoy! + Speaking of #PreppinData: Check out the fill site and all the weekly challenges here: Preppin' Data. On this site Carl and Jonathan provide a weekly challenge to manipulate a data set that they provide into an output they will publish. On the following week, they will add the solution file to the previous week's folder and set a new challenge. This is a great resource for everyone using Tableau Prep! + Zen Master Ken Flerlage posted a blog on how to create a date scaffold in Desktop and Prep here: Creating a Date Scaffold in Tableau . This was inspired by seeing a common problem in the Tableau Community Forum of missing dates. He shares, "For instance, you may want your visualization to always show all twelve months of the year, regardless of whether or not there is data for all twelve months. Quite often, the solution to these problems is to use a date scaffold. So, in this blog, I’m going to show you how to create and use a date scaffold in Tableau." This is a great resource and inspired by the work of many others. Ken's blog provides attribution and a detailed step-by-step guide. Welcome to the weekly Community Digest! We have some exciting news to share right out the gates today. 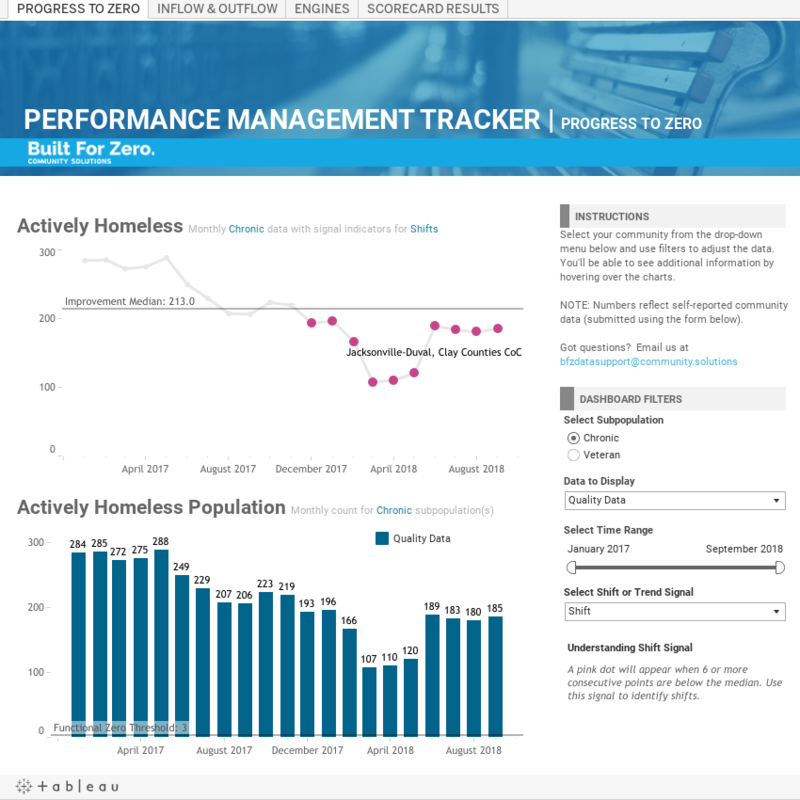 Today at SXSW the Tableau Foundation announced that it is committing more than $1.3 million in software, services, and financial support to help eliminate veteran and chronic homelessness in 50 communities across the U.S. by 2025. The partnership will help Community Solutions, a nonprofit expanding the use of data and analytics for its highly successful Built for Zero program. This grant helps all Built for Zero communities move from working with aggregate-level data to person-level data, while also helping automate the process of ingesting, transforming, and visualizing their data. I'd love to share a special shout out to Tableau Zen Masters and friends Lilach Manheim Ann Jackson Ken Flerlage Anya A'hearn Allan Walker & Neil Richards for your generous support of this work. Thank you! + Our next Think Data Thursday is this Thursday, March 14th with long-time Tableau Forum Ambassador Joe Oppelt . Joe will be discussing how to utilize sheet swapping to make your dashboards pop! Check out this link in the forum for details Think Data Thursday: How to utilize Sheet Swapping to make your Dashboards Pop - March 14, 2019 8 AM PST and be sure to RSVP here: Webinar Registration. Our most talked about thread this week had 17 replies and was resolved! Caroline Ettinger was trying to do a Rolling week comparison by week. She had done her due diligence and read a bunch of previous questions - but none solved for what she was experiencing. She was unable to share her original workbook but cleaned up a portion of the data which kicked the conversation into high gear. Thank you for all that supported Caroline in solving this issue and cheers to Don Wise for providing the correct answer. Welcome to the weekly Community Digest! We have a number of announcements and things to highlight this week, but I wanted to lead off with a diagram and an excerpt from a blog I recently read from Ben Jones - former Senior Evangelist and head of Tableau Public and founder of Data Literacy. The blog titled On Giving and Receiving Critique in DataViz Communities opens with a simple question, "When, if ever, is it okay to give unsolicited, constructive feedback in public to someone who shares something they’ve made broadly online?" This is something our team thinks about a lot as we support our growing global community. We strive to support the full spectrum of skills and abilities in data viz, from novice and those just exploring the field to Zen Masters. I often wonder, How do you show support, while also building capacity and helping people build confidence? When is it your place to do so - and how do you approach this professionally and positively? How can we do more - and where are we falling short? How can we nurture a culture that continues to do this as well - and what can we learn from our community? These are rhetorical questions and they do not have one clear answer. I encourage you to read Ben's blog and think about how this may apply to your work and your professional and social circles. I enjoyed Ben's thoughts on this topic, and the blog was supported by many leaders in data viz that I greatly respect. If his writing resonated with you please let him know If you would like to discuss this, or any other topics about the Tableau community with me, please don't hesitate to reach out! I can be found here or on Twitter @ettaboyle. Thank you for being a part of the Tableau Community and continuing to support each other and our mission to help people see and understand data. + Last week we announced the 2019 Tableau Zen Masters! Here is a link to the blog with all the details: Introducing our 2019 Tableau Zen Masters | Tableau Software . If you would like to follow the group on Twitter check out this list: @tableau/Tableau Zen Masters on Twitter. Two ideas in the forums received top marks for engagement; 'IN' Operator equivalent from Stephen Smirl and Ability To Select All Filters First Before Applying - Desktop & Server from Joseph Pirraglia. Joseph's idea has some valid comments asking how this is different than pausing live updates, and Stephen's has a number of workarounds showcased, and feedback shared from various Tableau employees. If you agree that these are needed features on the platform, or if you have more thoughts to add to the conversation, please log in to your community forum account to vote and connect with others. This week we are showcasing a thread from Rogier Koning : Date is randomly changing format form DD/MM/YY to MM/DD/YY where he shared, "I have an Excel sheet as data source. One column is a date in dd/mm/yyyy format. If I read the data into Tableau it changes the dates. Days with lower numbers get switched with the month while those with higher day-number (more than 12) day in the correct order." The issue was resolved when the contributors to the thread determined that OpenOffice was the source of the issue. If you have run into similar problems please read through the thread and continue to use the forums to look for solutions and to help others across the community! + Singapore based Zen Master David Murphy recently updated his Find-A-Zen Tableau Public dashboard with the 2019 cohort. Check it out to see where the whole group is based and more quality info! + Thailand based Ambassador Siroros Roongdonsai shared that they are having their second Tableau User Group in Bangkok on February 18th. We don't always highlight Tableau User Group meetings here - but we are incredibly excited to see the increase in engagement across APAC and very excited to support Siroros! Thank you for all your hard work. 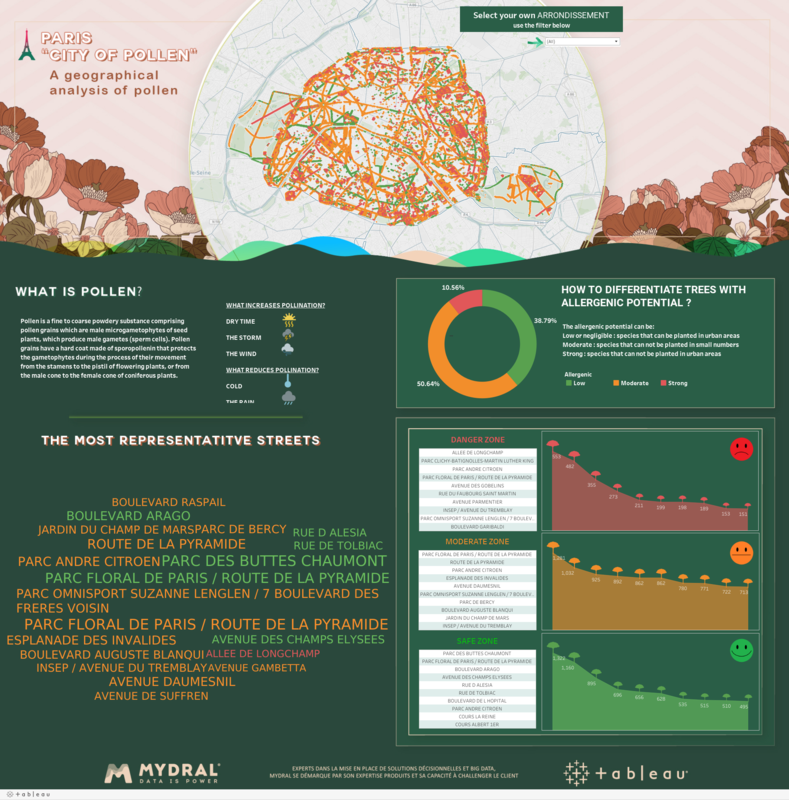 Welcome to another installment of our weekly digest on all things community from Tableau. Tableau Director of Evangelism Andy Cotgreave recently shared, Best of the Tableau Web: Celebrating 6th year anniversary and TC18, marking the 6th anniversary of these incredible round-ups. This one is worth a read + a share. We hope you enjoy all the incredible community content! + Our community - and the data viz community at large - is getting together this week for Tapestry Conference! Tapestry, taking place in Miami this Thursday and Friday, is an event designed to advance interactive online data storytelling. Tapestry brings different viewpoints together with the goal of generating a rich conversation about data storytelling. This two-day conference includes keynotes, short stories, discussion, and a demo theater designed to provoke ideas and discussion across disciplines. If you are planning to attend but have yet to register here is the link: Register for Tapestry. Every one can follow along with #tapestryconf on Twitter. + TC18 in New Orleans is barely behind us and we are already looking forward to seeing our #DataFam again at TC Europe in Berlin, 17-19 July, 2019! Join your fellow data lovers in Berlin, Germany at the Estrel to celebrate all things Tableau. Learn as much as your brain will allow with hundreds of hours of breakout sessions, hands-on-trainings, and one-on-one consultations with Tableau Doctor. Be inspired to do more with your data while networking with like-minded peers, then cap the week with thousands of your friends at Data Night Out. Register by 8 February and save €300 off the full ticket price of €1300. This week we heard from Maite Fernandez Huergo with our most talked about thread: Data get mixed with my sheets! The conversation has 10 replies going so far with Forum Ambassador Norbert Maijoor. Maite is facing some common troubles faced by many new to Tableau - and new to the Community forums, "I'm having a problem with my sheets and data. I have one excel document for each worksheet (tableau), but 2 of my worksheets use the same excel document, even if I tried several times to change the source of data. This is driving me crazy!" -- We feel your pain Maite! Thank you for working with Norbert to come to a conclusion. We hope you are able to solve this soon. Please update your thread and mark it correct once solved. Many new to the forums might miss this great resource: Getting Started in the Forums. Check out our 'Required Reading' section + Packaged workbooks: when, why, how and Resolving Issues in the Tableau Community. Join the conversation on this thread and let us know if these resources are helpful - or if there are any more we should highlight. Back at the top on our dashboard for Most Voted Ideas from the previous week we see Control what displays in View Data from 2012 we are now up to 1212 votes on this idea. As I shared on the thread back in October, "Please be assured that our development team is aware of this idea and we have discussed this. The last time we chatted I remember it not being on the roadmap but will continue to share feedback on this." Your ideas - and your votes on ideas - are communicated to our development team so please keep it up. We will share updates on feature requests as they become available and we encourage you to let us know what you want to see across the Tableau platform through our Ideas Forum. + Back with another fresh post, first year Zen Master and frequent Tableau forum contributor Ken Flerlage shared a blog about building a visualization of wind roses, which was inspired by a conversation he had in the Zen Garden at TC18. He shares, "On Thursday morning, I was hanging out in the garden and a gentleman mentioned that he’d been wanting to create a “wind rose” in Tableau (unfortunately, I have since misplaced his business card. If you were that person, please let me know so I can credit you properly)." Are you the missed connection? Please reach out to Ken on the forums or on Twitter and say hello! Welcome to another installment of our weekly digest on all things community from Tableau. We are just four weeks out from TC18 in New Orleans and are looking forward to seeing so many of you! Are you still on the fence about attending Tableau Conference? Don't delay and register today: Register for Tableau Conference! Will this be your first Tableau conference and you're unsure what to expect? Well we've gathered up a couple great tips & tricks blogs from members of the community to share. We bet after a quick read through these you will feel ready to join us in the Big Easy for a whole week of fun! If you are looking for more check out #fontinola on Twitter and add your own tips & tricks for seasoned pros and first-timers alike. Community member Jeremy Poole has posted a survey on Attendee Info for TC18. He is asking for people to, "Share your info to connect with peers who will be attending this year. Coordinate hotels/arrivals/common interests. Meet some new community members, and most of all...have a blast!" The most talked about thread in the forums this week was Daylight saving in Tableau posted on September 18th by Ivan Varga. Data Analyst and Tableau Forum Ambassador Zhouyi Zhang shared some helpful support - but the question remains unanswered. If you have run into issues related to daylight savings in Tableau this is a great thread to contribute to. With daylight savings time ending on November 4th this is something to be aware of as that is just a few short weeks away. If you fond this thread helpful (or any others in the forums!) you can bookmark them once you are logged in to your account - just look for the 'Bookmark' icon on the top right. This week we saw 5 more votes for the well documented idea, Apply number formatting inside a calculated field by Russell Lamb form back in 2012. The idea now has 658 votes and is considered "active", which means we are watching this, but it is not on the product roadmap. In summary he stated, "I need to be able to take numbers and apply number formatting to them based on the logic of my calculation. The number formatting should be exactly the same as the "Custom" formatting that tableau does now." Fortunately for everyone who has commented on or up-voted this idea Ben Dubois share a workaround on August 7th, highlighted in the comments. Here is what he shared, "We hacked this today using this solution: We had an aggregate calculation using a case statement to display the proper variable, and one of the values needed two decimal places while the others needed none. Due to the formatting limitations we couldn't remake anything, so the solution was to use a small floating box with the proper decimal value placed over top the table value. Quick n' dirty & hopefully helps someone who is waiting for this feature and googles it. Won't work for automatic sizing though." Welcome to the Community Digest! Each week share highlights on some of the great things happening across the Tableau Community - with a spotlight on the community forums. If you are keen to learn more about getting started in the Tableau Community I suggest you create a profile and help answer questions in the community forums - follow the Tableau Ambassadors and Zen Masters on Twitter - take part in Makeover Monday - find inspiration on Tableau Public - and join your local (or a virtual) Tableau User Group! You may not know this yet - but if you made it this far you are already a part of what makes this community so special! We are all here to help each other make connections so we can see and understand data. Thank you for helping us spread the data love and being a part of what makes Tableau so special! + Zen Master Hall of Fame member Andy Kriebel and Social Ambassador and Zen Master Eva Murray will be running a Tableau careers webinar series starting September 6th. This series kicks off with a webinar about how Tableau Conference can be used as a career springboard. There will be 6 weekly webinars with two presenters each, talking about their Tableau jobs, what they love about their work, how they got there and what they recommend to the audience from their own experiences. Check this out here - Webinars | Makeover Monday - Do you have your ticket to Tableau Conference yet? Do not miss out on this chance to join thousands of data rockstars in this great city! Get your tickets now. This week we are celebrating a couple great milestone! Naveen B has received the Answer Wizard badge, which is received after 100 people have marked your answer 'Correct', both ali twaij and praveen kumar earned their Calc Contributor badges for creating documents in the Workbook & Calculation Reference Library, and meenu choudhary earned the Help One, Help All badge for achieving 100 "helpful" votes! The most talked about thread this week remains unanswered: Need to display dot(.) in place of 0 asks, "All my measures are in FLOAT. I have a dimension with multiple measures. I need to display dot(.) in place of 0. For example: I have country, sales,target and quantity. all my measures are in float. I need to show dot(.) where zeroes are getting displayed." The thread has seen 17 replies and some really incredible engagement, but remains unanswered. Can you help Koushik Neelakantha find a solution? With over 5,000 active ideas in the forums it takes a lot for one to rise to the top. This week we see former community forum Ambassador and Zen Master Shawn Wallwork's Multiple Instances of Measure Names/Values Variable coming in with 8 new votes to a grand total of 732 votes. Shawn's idea states, "Allow us to create multiple instances of the Measure Names and Measure Values variables so we can assign groups of measures to one axis and a different group of measures to another axis. This would allow us to have a multi-measure line chart laid over a multi-measure bar chart without needing any Custom SQL wizardry." - Do you agree? If so, head over to the forums to up or down vote. + Zen Master and frequent forum contributor Ken Flerlage just shared part 1 in a developing series on SQL, focused on Tableau users - SQL for Tableau Part 1: The Basics Ken series of blog posts, "will attempt to provide a primer to SQL, with a specific focus on Tableau users." - This is one worth subscribing to if you are hungry for resources on SQL. There is also an ongoing thread on this topic on Ken's Twitter. Join the conversation! + From Tableau Public Ambassador Rajeev Pandey: "One aspect of data visualization we all have been discovering over the years is that when we talk about data visualization we often think that the choice of which graphical representation to use is the most important one to make. However, deciding what to visualize is often equally, if not more, important, than deciding how to visualize it. The goal of this visualization was to engage readers in finding and telling their own stories in the data. Special thanks to Neil Richards for this wonderful creation." Read more in Rajeev's blog! Welcome to another week of the Community Digest! We hope that you have heard all the buzz about of annual conference being in New Orleans this year. Well, in addition to heading to the Big Easy, we are excited to share that the $200 discount price for #TC18 tickets has been extended another week! Register today to save $200: http://tabsoft.co/2NVirnR This expires on Friday the 20th so don't delay! Are you new to the Tableau Community, or still on the fence about attending Tableau Conference? Tableau Ambassador and community veteran Gregory Lewandowski wrote this great piece for our blog: "I've been to 10 Tableau Conferences. Here's why I keep coming back." He breaks down the essentials + small things that make a big difference. If you're a newbie - or if you just have some questions - ping Greg on Twitter @lewandog and look for him in the Community area at TC18. Work directly with ISO 8601 dates in calcs. And we’ve made a lot of user experience improvements, allowing you to group data, set up more filters, and take actions on fields in the data grid. + Our most talked about thread this week comes from Hamza Alsalman on subtracting based on constant. Hamza shared, "I have a constant value for one date and I need to drag that value in its own column and populate all empty fields with this value. The value is retrieved by the following formula: SUM(IF YEAR([Prod Dt])=2017 then [Curr Bal Amt] END) I need this balance except for all dates >=2017 as I need to perform column subtraction. Thanks!" With 18 responses total the solution was found in just under a day by Deepak Rai. Thank you both for all your hard work! + Once again bringing you our top idea Control what displays in View Data. Thank you for your continued engagement! This idea has 1145 votes at present and has been flagged to our dev team. + Global Feeder #2 for Iron Viz just closed yesterday! Cheers to everyone who submitted an entry on the theme "Health and Wellbeing"
We will all have to sit in suspense as the entries are sorted and the winners are selected. Best of luck to everyone! Your work is truly amazing. The third and final feeder opens on Monday, August 1st and closes on the 28th. Check out this link for details! Thank you all for making the Tableau Community so special! community and team members. If you would like to nominate a community member as an ambassador please fill out this form. We will be accepting nominations until next Friday, July 6, 2018. More can be read about the program on our site here - and the nomination blog here. Iron Viz Global Feeder #2 is Open! The second feeder of the 2018 Iron Viz Global competition is officially open. The theme is: Health and Well-being. Submissions are accepted until 15th July 2018 (11:59:59 p.m. Pacific Time). See the FAQ page for details on how to participate, and for eligible countries of residence. + We’re honored and humbled to announce the Community Founders Award—inspired by individuals like Michael Cristiani who embody the spirit of the Tableau community. The recipient will be awarded an all-inclusive trip to #TC18. Nominations will be accepted until Friday, July 27, 2018 at 12:00 PST. + Our most talked about thread this week comes from lashon gaines asking for assistance with: Date Calculations in Tableau 10.2 Aggregation Issue. Here is the issue shared in the forums, "I am trying to calculate the total entries in 2018 by the overall total entries for 2017 and 2018 and I am getting an aggregation error. I tried the sum/total and it did not work either. Can you please help? I am looking for the total number of plans by the last certified date 2018/ total overall plans in my dashboard which is dated from 2017 and 2018. I don't have an open and close date to go by I only have the last certified date which I use as the close date. " This post has 30 replies, but remains unanswered. Thank you to Deepak Rai for all your support on this thread! It seems like you are getting there - but can anyone else help? Please check out the thread to see where it landed and if there is anything you can add. + Challenge Accepted: Tableau Evangelist and all around great guy Andy Cotgreave shared the following: "The Slightly Spooky Recamán Sequence. Anyone want to take on the challenge of building this sequence in #Tableau" on Twitter (this link). Zen Master Ken Flerlage and his brother Kevin were both up to the task. Check out Ken's recap blog post here: Two Approaches to Building the Recamán Sequence in Tableau. + Joshua Milligan & Bridget Cogley have an upcoming webinar on Tableau Tips and Tricks Round 2 this Wednesday, June 27th! Click on this link to register. + Zen Master Jeffrey Shaffer recently shared the post How to Make a Tadpole Chart and Other Charts in Tableau with Open Circles on his blog. + Zen Master Adam Crahen, otherwise known as one half of the DataDuo, shared a blog post: Imagine Adventure Day – #DataKids recapping a visit he made to his daughter's school where he taught over 200 students from 2nd to 5th grade Tableau! Thanks so much to the Tableau Academic team for supporting this with temp licenses for the school lab. It is with a heavy heart that I would like to dedicate this post to Michael Cristiani, honoring his legacy and sharing sincere condolences with his family and everyone he touched in the Tableau community. I have only been a part of the team here for a year, and never had the pleasure to meet Michael, or even work with him, but he sounds like a remarkable man with a kind heart and generous character. I feel like I could have learned a lot from him, and he is someone I would have liked to have known. We have felt and witnessed this sad news spread through the community, and I know Elissa and some other Tableau leaders have shared notes on Twitter. We know that this does very little at this difficult time, but thought it important to let you know our thoughts are with his family as well as all of you who knew him. Our former colleague Dustin Smith shared fond memories of early days with Mike, how he was honored as a leading community member on our 10th birthday, and this brilliant viz that was widely distributed years back: Pimp My Thanksgiving Meal. Michael's legacy and impact lives on in this community and with all those who he touched. Thank you for all you shared with us. You will be greatly missed. Cheers and congratulations to two community leaders for their notable achievements this week! Over 900 badges were awarded over the week, but the two stand out: Mavis Liu received the "Helpful is my middle name" badge for 50 "helpful" posts, and suman kumar is on their was earning the "Help Desk" badge for 5 answers being marked as helpful. The most talked about thread for last week from Renee Coker on Chronic Conditions Count Help gets back to where many of us started. The post opens with a note on how overwhelmed she has been with a project and an ask for help - We have all been there! Thank you Michel Caissie for rising to the challenge and working with Renee step-by-step to solve this problem! There were 26 replies on this thread over 48 hours - with Michael taking the time to explain nested calculations and the intricacies of pivot field values. It is a quality dialogue worth the read. * Kudos to Marc-Anthony Di Biase for sharing the Anonymize your Tableau Package Data for Sharing guide as well! Threads like this and support from community members is humbling and grounding! We are so lucky to get to support all of you. This idea, Control what displays in View Data from Darrin Schulte from 2012 is back on top this week with another 4 votes to get it up to 1113 votes. As Patrick Byrne shared last week, this is actively being looked at by the Tableau Product Management and Development teams for implementation to a future release. Keep voting and sharing your ideas for the Tableau product management team! + Joshua Milligan & Bridget Cogley have an upcoming webinar on Tableau Tips and Tricks Round 2 on Wednesday, June 27th! Click on this link to register. + Zen Master Christopher DeMartini shared this blog: Small Multiple Flows in Tableau including two Small Multiple Flow visualizations, built in Tableau, as part of this write up. + Zen Master Bridget Cogley shared this article from her blog: That First Link. Bridget shared, "Humans are social creatures. It’s how we survived. We’re wired to find tribes, to prize a sense of belonging. 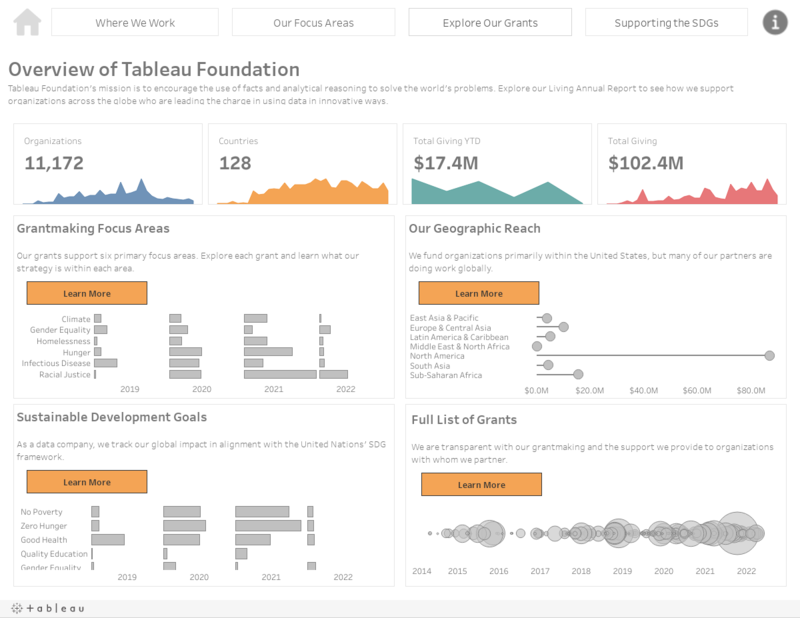 It’s why community – however it’s defined by the group…"
+ Zen Master Ken Flerlage sent over musings about analytics and data visualization: 3 Ways to Pivot Data for Tableau. Enjoy! The submissions are in for Iron Viz Books and Literature! The first feeder for this year's Iron Viz global competition is now closed with 60 fantastic vizzes submitted - and we need your help to choose the crowd favorite! Head over to the blog on Tableau Public to check out all the details and vote for your favorite: Iron Viz Books and Literature - Vote for the Crowd Favorite. Didn’t get a chance to participate in this round? Don't fret! We have two more rounds coming up this year – click here for the schedule. + We all have them: data sets that are dragons – from the cute but messy, to the most terrifying malformed monster. But they can be tamed with Tableau Prep! Join Tableau Zen Master Joshua Milligan to learn some techniques, from simple to advanced, to get your data under control in our next Think Data Thursday: How to train your data dragon Thursday, May 31st. Congratulations to John Kuo and Zen Master Ken Flerlage for earning the "Questions for Breakfast" badge and to Joshua Swickard on earning "Helpful is my middle name". These contributions to the Tableau Community help make the user experience so unique - snd special! Thank you to everyone for your support of others within the forums. Your efforts do not go unnoticed . The thread Calculate Bonus $ in the Month it is Reached from Roopa Shelton was the most discussed this week with 17 total replies and has been answered. A number of top contributors from the community helped Roopa find the solution including Peter Fakan Shinichiro Murakami Brian Cronin and Gerardo Varela. Thank you to everyone who engaged on this thread! It's amazing to see such generous engagement and thoughtful troubleshooting. Community Forum maverick and former Zen Master Shawn Wallwork's idea Multiple Instances of Measure Names/Values Variable from 2012 has emerged as the top voted idea for the last week. The idea is sitting on 686 total votes, with 5 new in the last week alone. Here is the idea, "Idea: Allow us to create multiple instances of the Measure Names and Measure Values variables so we can assign groups of measures to one axis and a different group of measures to another axis. This would allow us to have a multi-measure line chart laid over a multi-measure bar chart without needing any Custom SQL wizardry." If you agree go show it some love. There has never been an employee comment on this thread so we will highlight this to our developer team and hopefully find out if this 'active' idea is anywhere on the future roadmap. + Zen Master Ken Flerlage posted a blog about my attempt to create a 3D model of Saturn, called "Adventures in 3D". Check it out and let him know what you think! This week we are excited to highlight the winning vizzes for Iron Viz Europe 2018! We loved following the chatter and camaraderie on Twitter and across the community and were incredibly impressed by the caliber of entries. You are all truly amazing analysts and storytellers! From the topic of "European Cities" 29 entries were submitted. Out of those entries, three amazing vizzes rose to the top! Daniel Caroli's Metro Systems in European Cities, Klaus Schulte's Affordable Housing in Larger German Cities, and Sarah Bartlett's European Cities on a Budget. 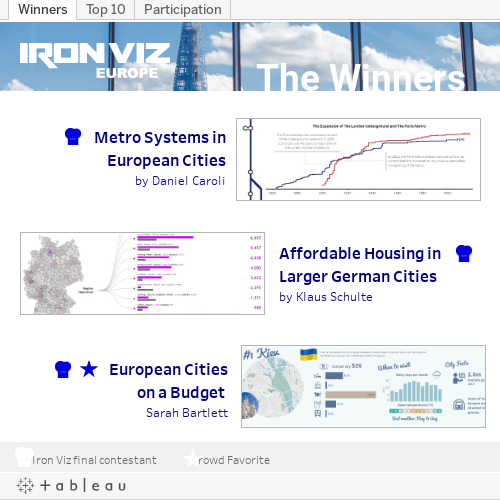 The authors of these three vizzes have each won a trip to London in July for Tableau Conference Europe where they will battle it out on the big stage for European Iron Viz Championship! You can read all about the scoring categories and process on the Tableau Public blog. Congratulations! + Project Maestro Beta #4 is under way! Try it out today by joining the Beta Program: Project Maestro | Tableau Software If you are already in Project Maestro beta join the Community Group. + We have eight community members that have reached the Viz Virtuoso level and another nine that have reached Analytics Ace in the last week. These tally-style badges account for overall engagement across the Tableau Community Forums with 6,700 points required for Viz Virtuoso and 5,600 for Analytics Ace! This is an incredible achievement and we are honored by all our community member's participation helping others see and understand data. + It's a little irregular for the Community Digest, but we would love to take this opportunity to recognize a huge achievement by Community leader and recently named Tableau Zen Master Chloe Tseng. Chloe is the founder of #VizForSocialGood, a community that promotes social good through data visualization. The important work she and the volunteers around the work have contributed through #VizForSocialGood has been recognized by Fast Company as a finalist in their 2018 World Changing Ideas Awards! Cheers and congratulations to everyone who supports this important work. + This week or most talked about thread with 20 replies is How to calculate sum of square of each element in the group from new community member Uday Kintali. The thread seems to go back and forth with Forum Ambassador Jim Dehner and community members Eric Hammond and Deepak Rai providing support. Thank you to everyone who continues to engage on this thread. Welcome to the Tableau Community Uday! We hope you are able to find a solution to your question. Please feel free to reach out to the community team for additional support if you are unable to resolve this on your own from the information provided. + Our top voted idea was created by Darrin Schulte back in 2012. The idea Control what displays in View Data has been featured numerous times in our weekly reports as it has 1082 votes at present. Check out the thread to see unique work-arounds shared if this is something that impacts your work flow. We have discussed this idea at length with our development team and do not have any updates to share with the community at present. We will continue to monitor this idea and share any updates as they become available. We’re who we are, and we’re where we are, because of bold-thinking, problem crunching, idea-inspiring people like you. The Tableau community showcases some of the best Tableau has to offer – a place where like-minded data rock stars can truly shine. Thank you for being you! 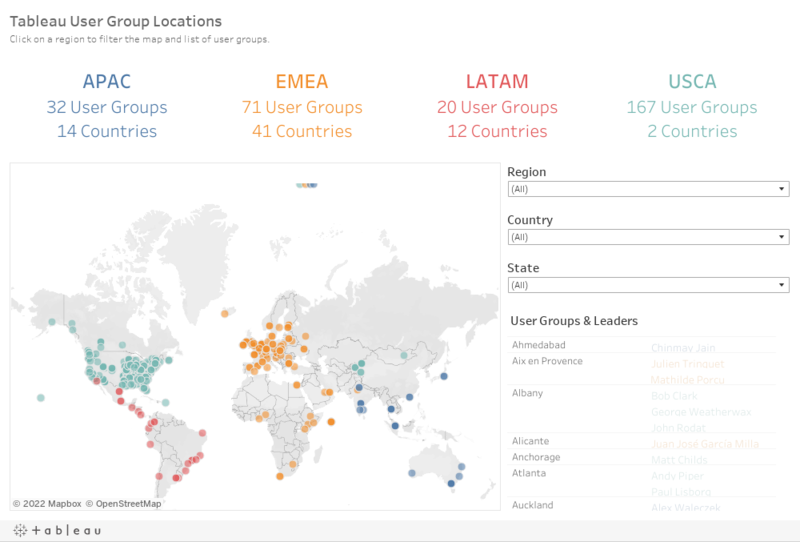 This week I would like to shine a special light on the incredible connections being made in Tableau User Groups. There are amazing events and meetings happening around the world. Check out the Events and Conferences page and use the viz below to find a TUG near you! + Forum Ambassador Simon Runc has posted this Educational Brain Teaser: Scatter Plot+ including a packaged workbook (you'll need 10.5) + the data in Excel, along with a GIF showing what the final viz should look like and how it should work. He'll post a written up solution by the end of the week! + We want to know: How do you deal with dirty data? Tableau Product Marketing Manager Tracy Rodgers has opened a thread in the forums to learn more about some of the frustrations and issues you are running into when you're preparing your data for yourself and for your organization. Check out some of her guiding questions and let it all out! We want to here the good and the bad. Thanks in advance! + Did you miss last week's Dev Office Hours? Check out the ongoing conversation and recording on the updated thread: Dev Office Hours: Mappy Hour – Working with Spatial Data in Tableau Thanks again to Kent Marten & team for their support! + The forum question What is best way to sum up number of checked columns was posted on March 14th by Buster Sammo and was successfully answer by Deepak Rai on the 15th. The thread had 17 comments just between Buster and Deepak, and four people have already marked it helpful! + Community member Stephen Smirl's Idea 'IN' Operator equivalent from 2012 has received 8 more votes this week, and have 476 votes and 33 comments to date. In the Idea he shared, "I would like an equivalent to the SQL 'IN' operator. Currently the only way to compare a list of values is by using an OR operator. This is very cumbersome when comparing a large list of values." Check it out in the forums to add your thoughts. We are in the third week of our celebration of Black History Month and are excited to be supporting Viz for Social Good. If you aren't familiar with the group here is a little backgroup: Viz for Social Good's mission is to empower nonprofits through data story. They help mission-driven organizations to promote social good and understand their own data through beautiful and informative data visualization. Check out their website to learn more: Viz for Social Good. Viz for Social Good selected the civic technology organization Pollicy, based in Kampala, Uganda, to highlight for Black History Month. Pollicy is looking to celebrate the achievements that women have accomplished in the past, and highlight the opportunities that we have to support more women in leadership positions, and particularly, women leaders focused on women's issues. Curious to learn more and explore the data? Click this link to see all the details and to download the data set. Remember to share your Vizzes with the world with #VisualizeDiversity on Twitter! + As was shared in the last edition of the Community Digest, we have selected a new group of Tableau Zen Masters! We want to take a moment here in the forums thank Tableau Forum Ambassador Shinichiro Murakami for his countless hours of support, and to congratulate him on becoming a Zen Master. Your dedication and discipline to responding to questions from the community is above and beyond what we ask from any of our ambassadors. We all appreciate the work that you do to keep the community, and our team of community managers and support, engaged and aware of areas where we can improve. As we have shared widely, the spirit of Tableau is our customers. We build software for the everyday person. By listening to and engaging with our community, we not only build better software, but ultimately a better company. Thank you Shin for embodying ethos of the Zen Master program as a teacher, master & collaborator. And just in case you are curious about the badges and points, here is more info: Points, Levels & Badges. Originally posted on February 15th by Greg Mooney he asked a question regarding, Create a calculated field to determine number of weeks selected in filter? Always quick to help, Tableau Forum Ambassador and newly appointed Zen Master Shinichiro Murakami responded just 10 minutes after the question went up! It took them to get on the same page, as you can see in the thread, but in between packaged workbooks and dozens of screenshots Shin and Greg were able to come to the correct solution. Cheers to your patience in troubleshooting! Community member Alex Kerin created the idea Horizontal Scroll Bar on tables back in 2012, and it remains incredibly relevant today, picking up 10 more votes in the last week. This idea has come up before and has been elevated to our development team. We continue to read and share your feedback on this idea (and others) and want to encourage you to share specific use cases where this is impacting your work.